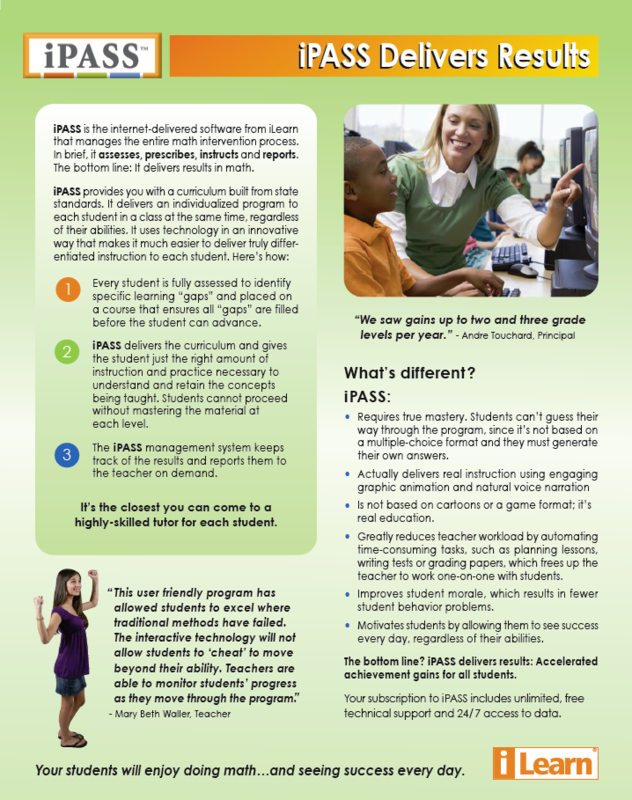 iPASS is the internet-delivered software from iLearn that manages the entire math intervention process. In brief, it assesses, prescribes, instructs and reports. The bottom line: It delivers results in math. iPASS delivers the curriculum and gives the student just the right amount of instruction and practice necessary to understand and retain the concepts being taught. Students cannot proceed without mastering the material at each level. The iPASS management system keeps track of the results and reports them to the teacher on demand. The bottom line? iPASS delivers results: Accelerated achievement gains for all students. Your subscription to iPASS includes unlimited, free technical support and 24/7 access to data.